Organic. Wheat & gluten free. Low-fat. 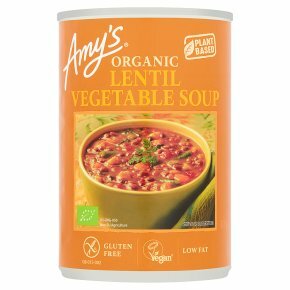 Vegetarian Society Approved.Amy's original lentil soup is so popular that we've created another delicious lentil soup. This one is full of organic vegetables including green beans, tomatoes and spinach in a hearty, flavourful lentil-based soup. We hope you like it as much as we do. Ready to heat, no need to add water.Ovens vary, so please use these instructions as a guide only. (800 W): Empty contents into microwavable container. Cover and heat on full power for 2 minutes. Stir and heat another 1-2 minutes until piping hot. Empty contents into saucepan and heat gently until piping hot. Stir occasionally. Please do not overcook.